(TibetanReview.net, Nov21, 2014) – As Chinese President Xi Jinping addressed Australia’s lawmakers on Nov 17 ahead of ratifying a free-trade agreement with Canberra, Tibet campaigners staged a vigorous protest outside the parliament house, demanding that China ease its grip on Tibet and end the persecution of its people. The Tibet protesters were among hundreds who had gathered outside the parliament, raising a range of grievances against the Chinese government and its communist party leaders. There were, however, dozens of Xi supporters as well, wearing red and waving China flags, separated by barricades from protesters who were chanting “Xi Jinping not welcome” and “Down with China,” reported Bloomberg.com Sep 17. The exile Tibetan administration at Dharamshala, India, said on its Tibet.net website Nov 20 that the Tibet rally was organized by the Australian Capital Territory (ACT) Tibetan Community, the New South Wales Tibetan Community and the Tibetan Community of Newcastle. 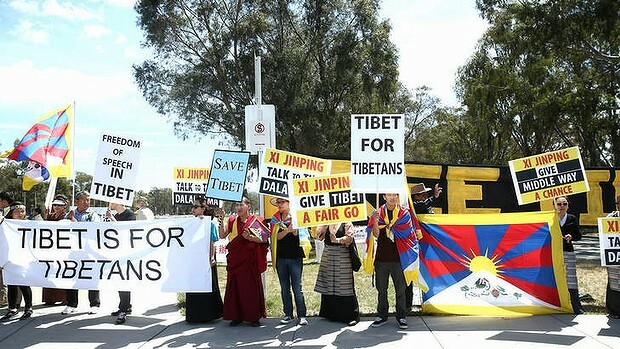 It added that the protesters highlighted the ongoing repressive policies of the Chinese Communist Party and called on the Chinese leadership to engage in substantive dialogue with Tibet’s exiled spiritual leader, the Dalai Lama. Media reports said Australian Prime Minister Tony Abbott praised Xi for his commitment to democracy.